and E. Rip and crosscut the slats to the dimensions listed in the Materials List. 2 Rip a 28"-long piece of 3/s"-thick stock to IW wide. Next, set your tablesaw blade to 30°, and bevel-rip the edges of the workpiece, as shown on Drawing 6 and 6a. Rip the blank to 3/s" wide, and crosscut 16 slat-groove fillers (L) I1/2" long. 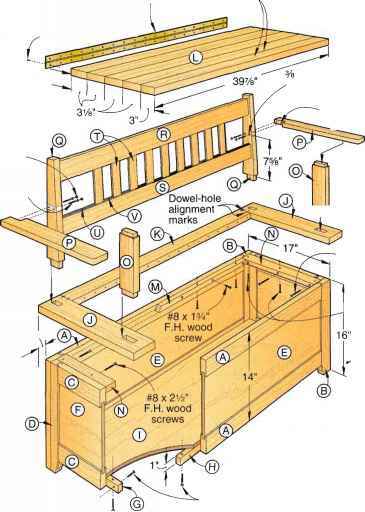 1 Dry-assemble (no glue) one of the side-slat assemblies, parts D, E, K, and L. Make any adjustments necessary, and then finish-sand the parts. Next, glue and clamp the assembly, making sure it is flat, and then check for square by measuring diagonals. (The assembly is square when the diagonal measurements are equal.) Use glue sparingly to avoid messy squeeze-out. Repeat the process for the other side-slat assembly. Let the glue dry, and then unclamp. 2 Cut the side panels (M) and back panel (N) to the sizes listed in the Materials List. Note that the grain direction runs vertically on these parts.